It’s that time of the year! It’s the start of ambassador application season. Are you passionate about your favorite races, clothing line, running gear, or nutrition? Are you quick to share your workouts with your friends and family? Do you overshare your fitness life on social media? Chances are your favorite brand has an ambassador program and you can continue to do what you do and earn some bonus swag or a race entry in the process! I’ve been fortunate to be an ambassador for several brands over the last few years. I’m currently an ambassador for a few nationwide brands: Hot Chocolate 15k/5k (Scottsdale Race Ambassador), Skirt Sports, Pro Compression, and Sweat Pink/Fit Approach. I’m also an ambassador for a local race, the Run 3rd 5k. Most ambassador programs have an application process which is towards the fall season or the end of the year. Some companies have rolling applications and accept and review applicants throughout the year. Others have processes which are simple and straightforward, just an introductory email to the ambassador coordinator. There are several types of ambassadorships and “rewards” may vary, depending on the company and your level of participation. 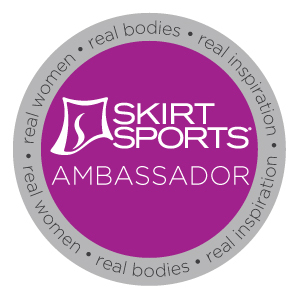 Some brands, like Skirt Sports, have established ambassadorships with different levels/tiers of expectation and a separate website to log into and record your participation (this helps you earn points for Gift Certificates or other perks! ), while others (like Pro Compression) have fluid participation expectations on Instagram, nothing fancy at all. They want to you to have fun with your socks! Some brands require you to have an existing following on social media, some don’t! Some brands offer an ambassador kit (clothing and gear) to their ambassadors without charge and others offer significant discounts on their ambassador merchandise and apparel. Ambassador programs such as BibRavePro and SweatPink/Fit Approach offer opportunities for ambassadors to review products or races. Race brand ambassadors typically volunteer or work at an Expo booth promoting an upcoming race. Some race brands only require their races be promoted across your social media platforms. Depending on the ambassador program there may be other companies that are sponsoring or affiliated with that particular ambassador program. These partner companies (nutrition or gear) may offer discounts or products to (clothing) ambassadors but keep in mind there may be agreements to only promote partner brands. When looking at ambassador programs, you should consider your personal brand. As an ambassador, you are acting as a representative of that company (even if you’re paid in swag). Sure the company is offering some pretty awesome swag, but are you really comfortable with their hashtag requirements? Can you commit to promoting their product (or their partner/sponsor products) exclusively all year (if that’s what they require)? Be honest and most of all, be yourself! Have you admired their products and their ambassadors? Or are you already a devoted user? Believe it or not, there are opportunities for both types of applicants! Most of these programs have private FB groups where information is shared with the ambassadors. Are you ready to join fellow brand loving individuals from across the globe? While at times it can be overwhelming, I feel like this is one of the best parts of being an ambassador! Connecting with others and meeting face to face at races is the best! Listed below are a few examples of ambassador programs and what these brands are seeking. If you’re passionate and ready for your next adventure; submit your application and book your ride on that Ambassador-ship! Posted in Ambassador, Skirt Sports, Sweat Pink/Fit ApproachTagged ambassadorBookmark the permalink.